Every game has a learning curve, but EVE is so complex that it's often said to possess a learning cliff instead. Part of why the New Order exists is to help new players ascend the cliff: Rather than making a lot of expensive mistakes, they can learn the game by reading the Code. I advise potential EVE players to read the Code a few times before they even begin downloading the EVE client (or going to Best Buy). Why? Because if they don't feel they can meet the expectations for their conduct as set forth in the Code, then EVE is probably too demanding a game for them--at least, at the present stage of their mental and emotional development. Better to work at meeting realistic expectations than to repeatedly fail at unrealistic ones. ...And it goes on. Look at those rules. I bet you didn't realize what a demanding job it is to mine AFK in highsec. And as the diplomat for Federation Exploration (FXP), Derfael had an especially heavy burden to carry. Agent Snigie sent Derfael a quick mail about Code compliance. Now Derfael had the chance to either live up to his expectations, or crash and burn. Derfael's reply was truly ominous. The man had acquired a very particular set of skills, ones which Snigie could only hope wouldn't be deployed against him. For all Snigie knew, this guy had graduated at the top of his Navy SEALs class. Snigie wasn't intimidated, though. Normally the miner would be told to calm down. However, Snigie had a hunch and tried an experimental new approach for dealing with internet tough guys. Success. Derfael's diplomatic skills weren't exactly setting world records, but he toned down his threats. Snigie felt comfortable enough to ask Derfael to take a first step toward obeying the Code by offering a "gf". What Derfael didn't realize is, in EVE, fights are meant to be one-sided. There's no counter to the Code. Negotiations were breaking down quickly. Derfael resorted to the "I have a stockpile of mining ships in case they all get ganked" line. When Snigie asked why he wasn't mining in one of his spare ships from the alleged stockpile, Derfael made an excuse and broke off all contact. 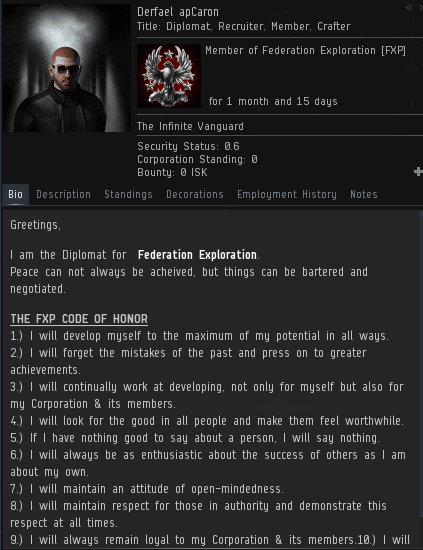 A few days later, Derfael was relieved of his duties at FXP and he left the corporation. 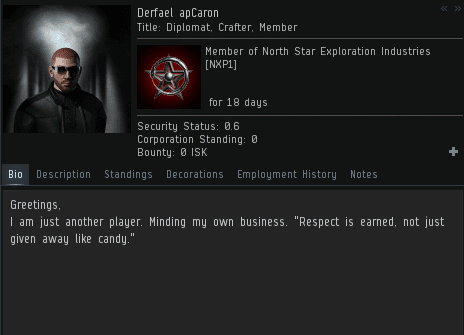 Derfael's new corp was similar to the old one, except for one key difference made obvious by his new bio: Expectations were far, far more realistic. Snigie keeping it real up in Verve Vendor. Good stuff! Oh, I'd say he's bringing some verve to the system! Beginners in forex trading should be persistent in practicing the strategies learnt to pave the way towards successful forex trading. Without firm understanding of the the strategies, successful trading is almost impossible to come by. I know this page is about freedom of speech but can we ban these annoying links? oh look another person who doesn't understand how freedom of speech works on the internet. AG knows they are failing non-stop daily and they are jealous of the forum traffic so they resort to spamming the comments. Nice work Snigie. Keep them Permited at all times. The arrogance of miners when faced with their own crimes is staggering. The idea that we need to 'earn' his respect is laughable – Derfael must recognise his place at the bottom of EVE hierarchy, refrain from petty ore theft, and learn to obey the CODE at all times in New Order sovereign territory. Keep up the noble work, Snigie! 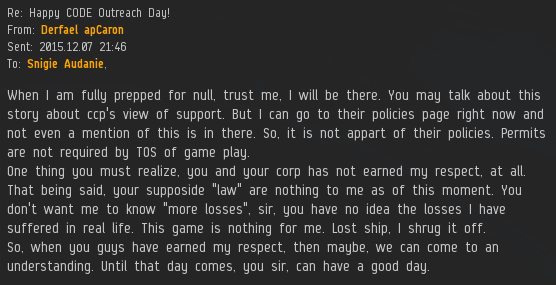 This miner got what he deserved; a swift boot from their corporation for refusing to follow the Law of Highsec. Not even "being a soldier" can excuse someone from following the Code while mining in Highsec! The Code is the most powerful Document ever written! And ALL who flout its rule shall know the consequences of non-compliance! Dude are you trying to troll or what? I'm pretty sure every agent has read that page by default. What's the point of spamming it? Not only that- but that page doesn't even tell anyone who would happen to go to it how to fit a catalyst. Yet Another example of Anti-Gankers Failing ALWAYS!!!! Honestly I'm not sure if that's AG. Why would they encourage people to read our Savior's wisdom? Doesn't make sense any way you analyze it. Wait, I just solved the mystery. He's posting that wherever you post. Yet another "Ming doesn't undock" failtroll. "Guys I was in the military and I fought for freedom and respect, did someone say military? I was in the army military military respect military freedom oh god I am awful at this game"
Glad the miner found another corp with more realistic expectations. Seems he's got a good head on his shoulders. Me may yet learn how to not lose ships without any "help" from CODE pirates. Rookie mistake there Abbot: check his killboard. Judging by his recent losses, Derfael is still derping. Hence the "He *MAY* yet learn..". I'm glad that he realized that paying one group among thousands wouldn't achieve anything. Hopefully he will learn how to fit and fly his ships properly. If he does, great. If not, oh well, not my problem. 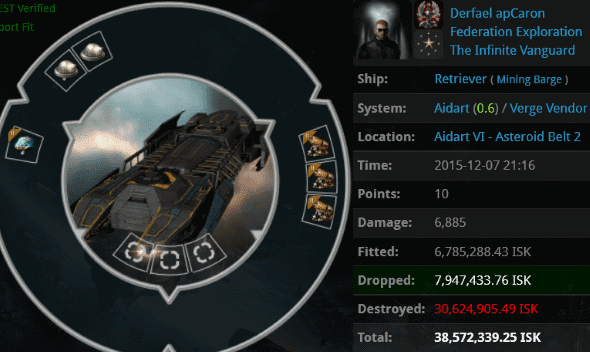 What IS the appropriate price one should pay to learn how to play EVE correctly? I don't believe even someone with your opinions would argue that EVE should be a free-to-learn experience. Prices in this game MUST be paid. Respect must also be paid. These are constants. Without prices, without paying, and without costs, how could anyone learn anything? How could we take pride in our accomplishments? And how could we feel that satisfaction that comes when we finally overcome our adversity- the "winning-a-fight-on-the-playground" satisfaction that comes only from a game like EVE? The fact that the New Order has the lowest prices in the galaxy for the lessons we teach is most certainly a mercy on the galaxy, as the prices that one pays to be Code-compliant almost always are magnitudes cheaper than the lessons they learn the hard way. I know this might be Thread Necroing but in perusing all of the archives I think that a square needs to be added to Miner Bingo: "I do X in RL".